Andrade, F.; Cusido, J.; Romeral, L.; Cardenas, J. Distributed generators systems and Microgrid are becoming more important to increase the renewable energy penetration in the public utility. 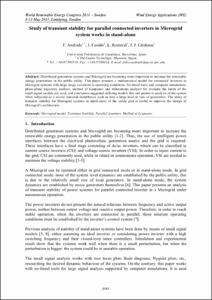 This paper presents a mathematical model for connected inverters in Microgrid systems with large range variations in operating conditions. No-lineal tools and computer simulations, phase-plane trajectory analysis, method of Lyapunov and bifurcations analysis for evaluate the limits of the small signal models are used, and conclusion suggested utilizing models that can permit to analysis of the system when subjected to a severe transient disturbance such as loss a large load or loss of generation. The study of transient stability for Microgrid systems in stand-alone of the utility grid is useful to improve the design of Microgrid's architecture. Andrade, F. [et al.]. Study of transient stability for parallel connected inverters in microgrid system works in stand-alone. A: World Renewable Energy Congress. "World Renewable Energy Congress, Sweden, 8-13 May, 2011, Linköping, Sweden". Linköping: 2011, p. 4185-4192.